Board games are a popular pastime and lend to socialization among friends and family members. There has been a resurgence in Toronto at places like Snakes and Lattes and their sister location Snakes and Lagers. When we think of digitization of these types of games, we think of computer or mobile games that transfer all the properties into the digital realm. However, I thought about when board games are only partially digitized and how assets add or take away from the experience. 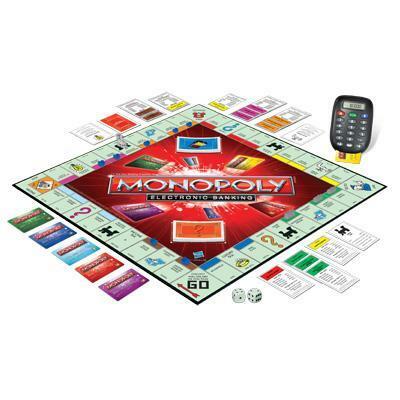 A couple of years ago, I purchased a new game of Monopoly with the electronic banking system. Monopoly originated in the United States in 1903 as an educational tool to explain taxation (Wikipedia, 2016). It has evolved into a pastime enjoyed by families with many versions available, such as Star Wars and Harry Potter. In this new version, you are given a card with preloaded money and all transactions flow through it. I found it difficult to keep track of my money because I was use to seeing it in front of me and had little tips on how I would spend it. My strategy was to place my $100 and $500 bills under the board out of sight, so that when I was in a pinch I had that extra money to spend. Now, with everything on the card, I could no longer do so. In addition, you could no longer cheat! My brother tried to scam some money as the banker, but was unable to do so because everyone could see the transaction via the machine. I found that this change from a material cash system to an electronic one diminished the experience of the game. The feel of the money, visually keeping count of how much you had, and, yes, even skimming some off the top. The change from a cash system to an electronic one was a reflection of how our society had changed. Rarely, do I see people walk around with cash; they rely on their debit and credit cards for everyday transactions. It is harder to keep track of your purchases this way and can easily lead to increased debt. It used to be that Monopoly would teach you money skills in the sense that you are given so much and once it’s gone (physically) you know you are bankrupt and need to sell assets to survive. With this cash system change it seems like those lessons are gone and replaced with the consumerism tied to digital money: you receive money electronically, you spend it using a credit card, and all you can see are numbers going up and down, from black to red. You no longer have the physical medium of money to learn the lesson of rational spending; the system becomes hidden with only a digital counter to belie its existence. Wikipedia contributors, “Monopoly (game),” Wikipedia, The Free Encyclopedia, https://en.wikipedia.org/w/index.php?title=Monopoly_(game)&oldid=701893421 (accessed January 27, 2016).